For an often-overlooked, “small market” franchise tucked away in the Northern Midwest, the Milwaukee Bucks are awfully accomplished. In 42 seasons, the Bucks have won their division 13 times, played in seven conference finals, made a pair of trips to the Finals and won a title- led by two of the ten best players in NBA history. Speaking of which, quite a few outstanding players have suited up for the Bucks, including three Hall-of-Famers (Lew Alciondor/Kareem Abdul-Jabbar, Oscar Robertson, Bob Lanier), a future Hall-of-Famer (Ray Allen) and a deserving franchise great who’s likely to miss out (Sidney Moncrief). While the early 1970s marked the franchise’s high point, the Bucks have hardly been anonymous since. You which team had the third best winning percentage for the decade of 1980s, trailing only the Lakers and Celtics? Yep, the Milwaukee Bucks. And they made the conference finals three times. While the 1990s were pretty tough, the Bucks bounced back to reach the 2001 Eastern Conference Finals. And sure, there have been a few lean years since, but if the 2009-10 season is any indication, Andrew Bogut and Brandon Jennings have sparked a new era of NBA prosperity in Milwaukee. Robertson took offense to being traded away by the Cincinnati Royals late his career, but reinvented himself in Milwaukee as a great veteran complement to a young Kareem Abdul-Jabbar. That 1970 trade proved to be a stroke of luck for the Big O, enabling him to finally win his first championship ring, and come very close to adding a second. After spending the early part of his career as the NBA’s ultimate statistical wonder, famously averaging a triple-double in 1961-62 and coming close in each of his first six seasons, Robertson quickly adapted to being the second option. While his numbers dipped, Oscar still averaged 19.4 ppg, 5.7 rpg and 8.2 apg in his first season with the Bucks, while assuming more of a pure point guard role. It must have been a dream playing alongside the unstoppable Lew Alcindor (Kareem Abdul-Jabbar), whom Oscar helped to 31.7 ppg, which along with 16 rpg won him his first of six MVP trophies. In 1970-71, Alcindor and Robertson powered the Bucks to a league best 66–16 record, including a then-record 20-game win streak. 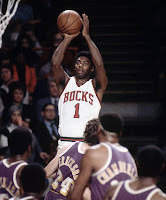 Both the Bucks and Oscar were equally great in the postseason, as the team won 12 of 14 games, including a four-game sweep of the Baltimore Bullets in the 1971 Finals. Meanwhile Oscar averaged 18- 5- 9 en route to his first ring. 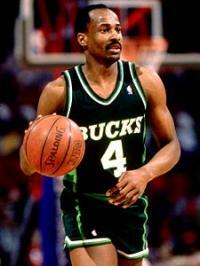 In his 47 postseason games as a Buck, Robertson averaged a solid 16 ppg and 8.5 apg. 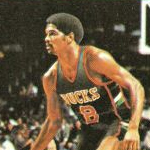 Though his numbers tapered off with each successive season, Oscar continued to play a major role in the Bucks’ success- the team won at least 59 games and a division title in each of his four seasons. However, it wasn’t until his last season (1973-74) that Oscar would return to the Finals, falling one win shy of a second ring, as the Celtics won in seven games. An extremely important off-the-court note from Robertson’s time in Milwaukee that may also rank as his greatest NBA achievement: In 1970, Robertson, as President of the Players Association, filed an antitrust suit against the NBA, leading to a reform of the league’s free agency system as well as the draft. The suit delayed the proposed ABA-NBA merger for six years, and resulted in far greater freedom and higher salaries for all future NBA players. The next time a guy has a joyous press conference to celebrate a $100 million free agent deal, it would be nice to see him thank the Big O, no? This case, combined with his vital role in the franchise’s lone championship that won the Big O this spot. Despite the legendary name, late in his career Robertson’s numbers with the Bucks don’t differ greatly from Sam Cassell’s (19 ppg, 4 rpg, 7.2 apg in 313 games), or those of the legendary Eric Mudoch (14- 3.2- 6.8). Remember the Bucks of the 1980s that made the conference finals three times and trailed only the Lakers and Celtics in winning percentage? Sidney Moncrief was their leader. Among fans, Sidney Moncrief is one of the most underappreciated players not only of his era, but is held in the highest regard by numerous greats that squared off against him. Among others, Charles Barkley, Magic Johnson and Michael Jordan have all expressed their strong admiration for Moncrief who was the best two-way perimeter player of the early-1980s. Not only was he blessed with outstanding athleticism and versatility, Moncrief was the ultimate “hustle guy,” especially on the defensive end, where would earn back-to-back Defensive Player of the Year awards (1982-83 & 1983-84). While his overall numbers with the Bucks are impressive, from 1982-86, Moncrief’s prime healthy years, he was a fixture in the top-tier of NBA two-guards, averaging 21 ppg, 5.8 rpg, 4.7 apg. From 1982-86, he was selected to five consecutive All-Star teams, named to the All-NBA first team in 1982-83, and All-NBA 2nd Team and All-Defensive 1st Team four times each. Moncrief was the face of the 1980s and remains in the top five in franchise history in games played (695; 2nd), minutes played (22,054; 2nd), assists (2,689; 2nd), points (11,594; 3rd) and steals. Statistically, Ray Allen (19.6 ppg, 4.6 rpg, 3.8 apg, 1.2 spg in 494 games), who also led the Bucks to the conference finals, would get the nod here, but Moncrief was essentially a one-team guy and simply meant too much to the franchise in the most competitive era in league history. Rounding out a pretty solid three-man race here is Michael Redd, whose gorgeous left jumper seemed destined to one day win this spot. In his time with the Bucks, Redd has a been fantastic, averaging 20 ppg, 4.3 rpg and making 999 3-pointer (hitting 38.4%). However, a string of injuries have turned him into an occasional contributor, while a mammoth contract has transformed him into little more than cap relief on July 1, 2011. Johnson was selected third overall by the Bucks in the 1977 draft. This proved a wise selection, as Johnson went on to become a three-time All-Star, was selected to the 1978-79 All-NBA Team and was one of best forwards of the early 1980s. Johnson teamed with Sidney Moncrief for a string of excellent Bucks’ team that won five straight division titles from 1980-84 and made consecutive trips to the conference finals in 1982-83 and 1983-84. Johnson averaged 20+ ppg in five of his seven seasons, including a career-high 25.6 ppg in 1978-79. During his run Milwaukee, Johnson was not only one of the league’s best scoring small forwards, but perhaps the NBA’s best frontcourt ballhandler as well. Following the 1984 season, Marques Johnson was traded to the Los Clippers in exchange for a trio of player that included fellow stud SF, Terry Cummings. Cummings, the man for whom Johnson was traded, is the primary competition here and comes in a close second. Cummings spent five seasons with the Bucks, averaged 19.4- 7.8, made two All-Star teams, and played a major role in leading the Bucks to the 1986 Eastern Conference Finals. A relatively weak lot to pick from here, but let’s not forget how good this guy was. Baker spent four seasons (three of them excellent) on some forgettable teams in Milwaukee. He developed into a consistent 20- 10 guy and earned an All-Star selection in each of his last three seasons with the Bucks. 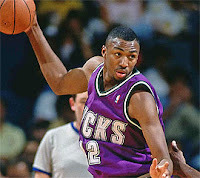 In his short prime, Vin Baker was one of the NBA’s best and most athletic big men. Baker was one of the first of the modern crop of athletic big men who combine rebounding and inside scoring with athleticism and a mid-range jumper. Sadly his career was derailed by emotion problems and alcoholism, but in the first five seasons, Vin Baker was basically Chris Bosh. At his best, how good was Vin Baker? Put it this way: following the 1997 season, Baker was given a seven-year, $86 million contract- and at the time no one thought it was crazy. Sure, it didn’t take long for that opinion to gain steam, but you get my point, right? Right? 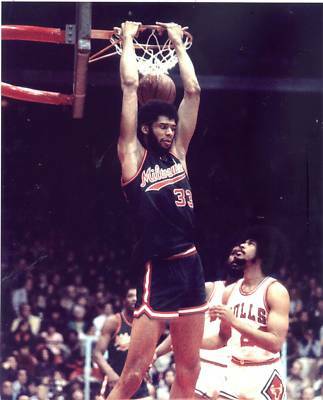 Arguably the greatest player in NBA history, Kareem was an absolute force with the Bucks. As good as he was after arriving in L.A., Kareem’s peak in terms of individual dominance came in his time in Milwaukee. Six All-Star selections, four All-NBA selections and three MVP awards in six seasons. 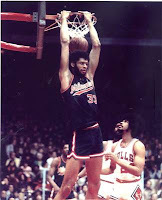 Never averaged less than 27 ppg or 14 rpg, and produced one of the great statistical seasons by a center in 1971-72 when he averaged 34.8 ppg, 16.6 rpg and 4.6 apg while playing in 81 of 82 games, averaging over 44 minutes per game. And in the playoffs? He was every bit as good, averaging 29.7 ppg and 16.7 rpg in 57 postseason games. Not bad. Not only was Kareem statistically dominant in Milwaukee, his Bucks teams won 56+ games in each of his first five seasons, capturing four division titles. On top of all that, in his second season, he joined forces with Oscar Robertson to bring Milwaukee its only title. Hey, LeBron… now that’s how you leave a city!